The Giro’s second queen stage traverses the Western Alps, and features four categorized climbs, all of them long and demanding. After the Colle del Lys, the stage hits the Colle delle Finestre—this year’s Cima Coppi, as the highest point—and its nine-kilometer stretch of dirt road. The course then climbs to Sestrière, before proceeding to Bardonecchia (Jafferau), a final seven-kilometer climb that averages nine percent. The final pitch should be a battleground for the strongest GC men. 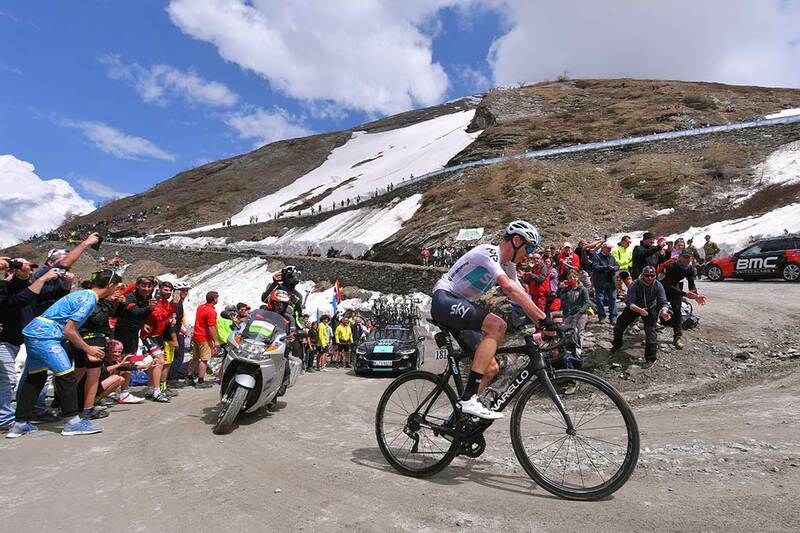 With an attack on the Colle delle Finestre, the Giro d’Italia’s highest climb, Chris Froome escaped with more than 80 kilometers to race and seized the overall lead with a win in stage 19 Friday. Simon Yates (Mitchelton-Scott) was no match for Team Sky’s four-time Tour champion, losing his grasp on the pink jersey and falling well down in GC the standings. Tom Dumoulin (Sunweb) did his best to keep Froome in check on the massive day to Bardonecchia that had 4,500 meters of climbing. But he finished the day right where he began, second place overall, now 40 seconds behind. After riding with Dumoulin through the day, Thibaut Pinot (Groupama-FDJ) moved up to third overall, 4:17 back. On the heels of some fierce pace set by his Sky teammate Kenny Elissonde, Froome attacked low on the Finestre, just after the road turned to dirt. By that point, Yates was already dropped. The GC hopefuls saw a big opportunity on one of the Giro’s most mountainous days. The Brit gained some time over the top of the Giro’s Cima Coppi — the highest elevation of the race at 2,178 meters. However, he gained a lot more ground on the perilous descent, flying downhill with reckless abandon. A chase group of five formed behind: Dumoulin, Pinot, Richard Carapaz (Movistar), Miguel Angel Lopez (Astana), and Pinot’s FDJ teammate Sebastien Reichenbach. They kept Froome within striking distance through the valley to Sestriere, the day’s penultimate climb. Once Froome was over the top of that Cat. 3 climb, though, he had extended his advantage to three minutes. He continued his march up the finish climb on Jafferau, near Bardonecchia. Dumoulin’s chase was hampered by Carapaz and Lopez, who were squabbling over the best young rider’s white jersey. Pinot also tried an attack midway up Jafferau. Despite those jabs, the group of five entered the closing kilometers together, and Carapaz uncorked one last attack to take second. Pinot ended up third, gobbling up the last time bonus at the finish. Froome will need to defend the leader’s jersey in one final mountain stage Saturday. Stage 20 will kick up halfway through the mammoth 214-kilometer ride to Cervinia with three categorized climbs a Cat. 1 summit finish.